Dylan Buc, a fifth-year student at UT Knoxville’s College of Architecture and Design, proposed “The Agora” plan for a new visitor center at Nashville’s Centennial Park. Nashville may be a city on the rise, attracting new residents by the droves. But it’s also a laboratory for students at the University of Tennessee-Knoxville’s College of Architecture and Design, where they are designing the communities of the future in partnership with the Nashville Civic Design Center. Led by UT urban design professor Thomas (TK) Davis, the program lets students leave their mark on the city. Much of their work has been incorporated into city planning, from helping produce the Plan of Nashville’s long-range vision for the urban core and mixed-use developments along the waterfront to transit-oriented developments, micro-housing residences and a new visitor center for Centennial Park. “The feedback on their work tends to be very positive,” says Davis, who served as the CDC’s design director from 2004 to 2008. “One of the great things about working with students on projects is that student work is not threatening. It’s not like a developer coming in and saying, ‘Here, this is what I want to do.’ Also, you get a range of ideas. The NCDC was founded in 2000 as a partnership between the city of Nashville, Vanderbilt University and the UT architecture school with the goal of increasing public knowledge and participation in how the city was evolving, and providing vision for future growth. One early initiative was a monthly Urban Design Forum that brought together interested citizens to discuss topics and issues relevant to urbanism. Since fall 2008, Davis has been directing his urban design students on projects that address a range of development issues and opportunities in greater Nashville. Those include increasing public transit via bus rapid transit or commuter rail, and creating transit-oriented developments (TODs), also known as transit villages, within a 2,000 foot radius of the stops. 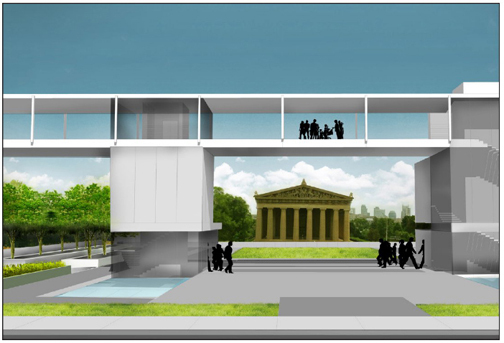 Joshua Parsley, a fourth-year student at UT Knoxville’s College of Architecture and Design, proposed “A Bridge to Centennial” plan for a new visitor center at Nashville’s Centennial Park. TODs are higher-density, mixed-use walkable neighborhoods with ample public space and the ability of residents to walk to the train or bus instead of commuting by car. “Transit villages would help enormously, over time, [with] the Greater Nashville Metropolitan Planning Organization’s 25 year vision for transit in the region,” Davis explains. UT-K students did early work on the Hamilton Station TOD, the first in Tennessee, that is now being built in phases in Lebanon around a Music City Star depot. Students tackled site challenges including flooding, which necessitating elevating buildings above the water table. “They said they never had a rezoning go so quickly because of all the work we had done,” Davis notes, with evident pride. They also worked on a transit-ready development planned for Gallatin along a future northeast corridor transit line. Both projects are by Lose & Associates, an architecture, landscape architecture, engineering and planning firm in Nashville. Students have also designed four different mixed-use projects in Donelson – one including a hotel – as well as mixed-use infill projects along First Avenue related to the Nashville Riverfront Redevelopment Master Plan. Two years ago, they produced a book of designs and precedents for the concept of micro-housing in downtown Nashville. “Micro” apartment units are typically 350 to 400 square feet. UT student projects can be viewed on the Civic Design Center website at www.civicdesigncenter.org/projects/utstudentprojects. Nashville developer Tony Giarratana has announced plans to build a 15-story Midtown apartment building featuring micro-units averaging under 400 square feet for a studio. Several Gulch apartment buildings already offer units measuring between 400 and 600 square feet. Besides the big-picture urban planning aspect, micro-housing also presented the students with the architectural challenge of making small spaces feel larger spatially and designing a building with communal spaces to encourage social interaction. Students in Davis’ design studio meet 12 hours a week on campus, typically working in small teams on projects, and are expected to work at least an additional 12 hours outside of class. That means a dozen students over a 14 week semester produce more than 4,000 hours of civic design work. The class travels to Nashville for site visits and reconnaissance, presentations of their work at the Civic Design Center, and rounds of feedback from top professionals from Nashville’s architecture, design and development community and city officials. After a final review, student design work is exhibited at the Civic Design Center and typically included in research reports published by the Metropolitan Planning Organization, which sponsors the studio and helps defray travel expenses. Last spring, the class was sponsored by the Metro Planning Department, which incorporated student work as part of its three-year NashvilleNext initiative to plan for an influx of 1 million new residents in Middle Tennessee. “The implications of that are profound in terms of transit and infrastructure and housing especially,” Davis explains. “All the easy sites to develop on have pretty much been taken in Greater Nashville. Those include places like Antioch, where students developed major projects around vacant “big box” retail sites and neighborhoods with opportunities for more infill and improved walkability. 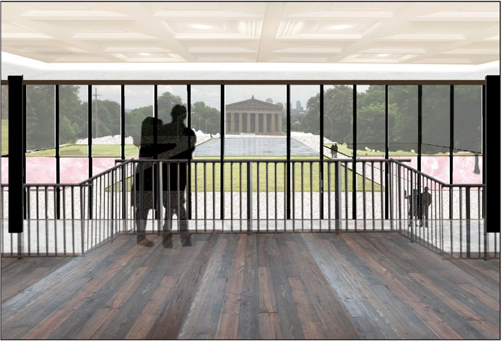 This past summer, five students produced five designs for a visitor center at Centennial Park that will be located several hundred feet from the Parthenon. The sloping site presented a challenge to the students, who eventually conceived of a structure that emerges from the ground and provides views of the park via an elevated terrace. Students also work on affordable housing concepts, which helps prepares them for the challenges of adding design value that developers may not envision at the outset. In the spring, they work in partnership with students in Vanderbilt’s Owen Graduate School of Management real estate development capstone program on a market analysis of their projects, such as the transit villages. They also do a pro forma, or an economic analysis of project cost and return on investment. “Frequently, the projects pencil out,” Davis says. “That means what would happen if they appeared in reality would [they] be viable economically. While Davis calls urban design a “slowly unfolding reality” that takes years to realize, he and his students derive great satisfaction from seeing projects conceived in their Knoxville design studio rise on the Nashville skyline. “I have a passionate commitment personally after four years out there as to what a great city Nashville is,” he says, speaking from his office on campus in Knoxville.